Back in June, we reported on Logitech’s new MX Air mouse. Now, in mid-July, it’s finally out and the reviews are in. So far, they’ve been excellent. For those wondering why a mouse is even remotely interesting to them, you should know that the MX Air lets you control your computer using hand gestures in the air. The best part of this though, those hand gestures actually work. Just like the iPhone’s flicking and pinching, the MX Air uses fairly natural movements to control your home media, meaning when you use this in the air, it’s generally for controlling a home media PC. A wave to the left or right will adjust the volume, and flick will skip to your next track. Once you’re done listening to some tunes or watching a video, you still need a high quality mouse. There, the MX Air is great as well, with a standard laser tracker and good ergonomics (although it looks odd, eh?). 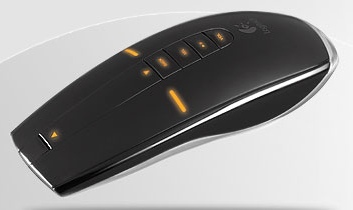 Besides the interesting Freespace commands and stylish design, this mouse is fairly boring. Rather than going completely wireless with Bluetooth, the MX Air uses a 2.4 GHz receiver, leaving you with an annoying USB dongle to plug in. Other than supporting the fair bit of users without Bluetooth, this seems silly. I would think anyone paying $150 for a mouse would have some for of Bluetooth. . . There’s also an equally stylish charging station for the Li-on battery. Those nifty little hand gestures and cool yellow lights are really going to cost you. For the privilege of owning the MX Air, you’ll have to fork over $150. I’m still happy with my $50 Mighty Mouse or a standard USB mouse.